This is the Waterline Series Two-Way, Spring-Return, Plated Brass Ball and Stem Ball Valve Assemblies without End Switches. These Ball Valves are designed to regulate the flow of hot or chilled water and, for some models, low-pressure steam in response to the demand of a controller in HVAC systems. 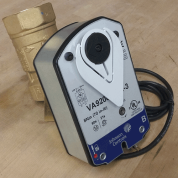 Available in sizes 1/2 through 2 in., this family of two-way forged brass valves is factory or field mounted Spring-Return Electric Actuators for on/off, floating, or proportional control. Forged Brass Body — provides 580 psig static pressure rating. Chrome-Plated Brass Ball and Stem Assembly Standard — handles both chilled water and hot water applications with a fluid temperature range of 23 to 203°F (-5 to 95°C). Graphite-Reinforced Polytetrafluoroethylene (PTFE) Seats — include 15% graphite-reinforced ball seals, providing better wear resistance. 500:1 Rangeability — provides accurate control under all load conditions. Maintenance-Free Design — performs without failure in excess of 200,000 full stroke cycles in iron-oxide contaminated water. If the Waterline Controls Series Ball Valve fails to operate within its specifications, replace the valve body, actuator, or entire assembly. For replacement parts, contact the nearest Waterline Controls representative.